Sir James Kirby’s status as one of the great industrialists in Australia’s history is assured. His philanthropic spirit will also live on courtesy of one of the nation’s most respected charitable foundations. Born on June 15, 1899, in Sydney, James Norman Kirby was the third son of Victorian-born parents Louis Kirby, a plasterer, and his wife Margaret. Educated with his four brothers at schools in Newtown and Marrickville, Jim as a boy had a fascination with speed, flight and endurance. His ingenuity and dedication to the welfare of his peers also came to the fore early in life: his classmate Colin Carmichael once recalled that in sixth class ‘Bluey Kirby’ took the teachers’ canes and hid them under the school buildings. In 1914, Jim started an apprenticeship with a motor mechanic business, the Co-operative Motor Society in Woolloomooloo, and earned 7s. 6d. a week. Later, he finished his training at Howarth’s Petrol Economiser Co and, in 1924, launched his entrepreneurial career by renting for £2 a week the plant and tools of his employer, Fred Howarth. Repairing motorbikes gave Jim a start in business, and the vehicle also helped him woo young saleswoman Moya Wessler. She would later write of the days when Jim picked her up and ‘off we would go, flying down from Stanmore where I lived, to the dances held at Newtown Town Hall’. The couple went out for six years before marrying at St Paul’s Catholic Church in Dulwich Hill on November 21, 1925. They had two children, Kevin and Raymond, who assumed the reins of the Kirby empire in future decades – building on their father’s business foundations to grow an internationally renowned manufacturing operation while continuing to foster his greatest legacy, the James N. Kirby Foundation. Throughout his business career, Jim Kirby displayed impeccable timing and an incredible instinct for a deal. Within 12 months of starting his business, he had paid Howarth £2000 to settle their handover deal. Making a name through the quality of his engine reconditioning, he switched from motorcycle to car repairs as the motoring boom began. Already, the Kirby commitment to superb workmanship was ingrained in employees and Jim adopted the micrometer – a symbol of accuracy – as a trademark for his business. By 1932, the 186 square metre (2000-square-foot) workshop in Australia Street, Newtown, was too small for Jim’s now 25-strong team. On March 19 of that year, the day the Sydney Harbour Bridge officially opened, Kirbys was busy transferring to a freehold property in Salisbury Road, Camperdown. The plant focused on the production of car engine components and the machining of diesel engine blocks, crankshafts and bearings for railway rolling stock, buses and ships. Factory space kept expanding along with employee numbers, and when World War II started after Adolf Hitler’s troops invaded Poland, the Kirby workforce of about 150 switched quickly to production work for the Army and Air Force. About 12 months into the war, Jim was personally commissioned to set up a CAC aircraft engine production facility in Lidcombe, which was ultimately responsible for manufacturing the Rolls-Royce Merlin aircraft engine. The end of the war cleared the way for the formal incorporation of the business through James N. Kirby Holdings Pty Ltd on September 24, 1946. Priding itself on superior workmanship and loyalty to staff, the business began a complex transition to become a post-war manufacturer of consumer goods such as refrigerators. With Jim as mastermind, Crosley refrigerators and television sets, Bendix washing machines, Pye transistor radios and other household goods soon started rolling off the factory production lines. As a man of high business and social standing, Jim Kirby was inevitably in demand in industry, corporate and community circles. He was a logical selection in 1958 as founding chairman of the Manufacturing Industries Advisory Council, and over the years served as a director of many companies, including Qantas Empire Airways. An honoured Rotarian, Jim was also a director of the Australian Elizabethan Theatre Trust and deputy chairman for many years of the Winston Churchill Memorial Trust. His disparate interests led to involvement in bodies such as the Industrial Design Council of Australia, the Australian Defence Mission to the United States, the Australian Nuclear Science Foundation and the Sydney Opera House Appeal Fund, among others. Knighted in 1962 for services to industry, the honour recognised a man whose business acumen and community respect was matched by few. 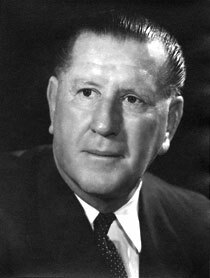 By the time Jim died of cancer in 1971, he had established an imposing business record on the back of a manufacturing operation that had delivered an incredible range of products to Australian industrial and domestic markets. While Jim Kirby’s industrial achievements are without dispute, his determination to give something back to his workers and the community was exceptional. In this respect, two initiatives stand out: the Kirby Apprenticeship School and the James N. Kirby Foundation. The former represents a proud part of the Kirby family’s business history in that Jim’s brainchild was later embraced and grown by Kevin and Raymond. At its peak, 270 apprentices attended the school and it became a model for such training facilities. Annual awards for top apprentices were introduced and, at the 1946 graduation, 120 apprentices signed and presented to Jim Kirby a limited-edition copy of Edward Fitzgerald’s translation of The Rubáiyát of Omar Khayyám, a famous work of poetry that reflects on life, the fact that it should not be wasted and is best managed with a drink of wine. Yet the James N. Kirby Foundation is Jim Kirby’s most important bequest. A charitable man at heart, the senior statesman of the family had long admired the philanthropic nature of American entrepreneurs. On October 17, 1967, he established the Foundation for educational and charitable work with a grant of $2 million, most of it from his personal fortune. A private company with Jim, Kevin and Raymond as the shareholders, it was at the time the fifth-largest personal foundation in the nation behind only the Felton, Buckland, Power and Walton and Eliza Hall funds. The Foundation’s coat of arms included a boomerang and symbols of manufacturing and nuclear energy. The motto bore an Aboriginal term, Ngaben-Bidjigarme, meaning ‘I hold all hands’ or ‘I serve all’. Aside from inspiring the title of Jim’s biography, I Feel I Should Plough Something Back, the words – mouthed just four years before his death – have served as ongoing inspiration for the work of the Foundation’s board. The first major donation of the Foundation was $40,000 to the Duke of Edinburgh’s Third Commonwealth Study Conference. Over subsequent years, it has parted with millions of dollars for an ever-widening spectrum of good causes. Over time, the Foundation’s baton has passed from Jim to his sons Kevin and Raymond, and in more recent years has been picked up by three members of the next generation of Kirbys – Kevin’s daughters Margaret and Helen as well as Raymond’s sons James and Michael. While Jim died before seeing the impact of many of the Foundation’s deeds, he would no doubt have been proud of its achievements. A year after his death, the marine research vessel James Kirby launched on the back of Kirby Foundation funding, and in 1974 the Argon Laser Photocoagulator was presented in the presence of Lady Kirby to the clinic at Prince of Wales Hospital run by the late, great Fred Hollows. From its inception the Foundation has had a policy of ensuring that grant recipients’ projects succeed and funds are well spent. Evidence of the policy is Kirby House, a self-contained residence for visiting scientists at the Lizard Island Research Station in north Queensland. It was built in 1982 with funds donated to the Lizard Island Reef Research Foundation by the Kirby Foundation, which continues to support this initiative. The James N. Kirby Foundation continues to invest in Australia’s future. It stands as a proud symbol of community commitment from both the third and fourth generations of the Kirby family. Jim Kirby would have been proud not only of the achievements of the Foundation but the way in which it has empowered family, business and board stakeholders to work for the betterment of the community. We reprint those sentiments here for they encapsulate the man and explain why Jim Kirby set up this Foundation. It represented his visions and ideals – and continues to do so today.